Art market, London, 1980s; (Daniel Katz, London); (sale, Sotheby's, London, 5 July 1990, no. 139); (Anthony Roth, London); (Michael Hall Fine Arts, New York); purchased 7 June 1991 by NGA. A telephone message from Sotheby's, London, 6 May 1991 (in NGA curatorial files), reports that the bronze was acquired from an unidentified antiques dealer in King's Road, London. According to Nicholas Penny, in notes recorded October 2004 when Daniel Katz visited the NGA, Katz consigned the sculpture to the 1990 sale and he [Katz] thought that Roth was the purchaser; notes in NGA curatorial files. National Gallery of Art. 1991 Annual Report. Washington, D.C., 1992: 16. Sculpture: An Illustrated Catalogue. National Gallery of Art, Washington, 1994: 41, repro. Butler, Ruth, and Suzanne Glover Lindsay, with Alison Luchs, Douglas Lewis, Cynthia J. Mills, and Jeffrey Weidman. 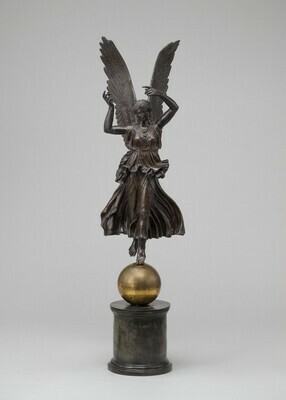 European Sculpture of the Nineteenth Century. The Collections of the National Gallery of Art Systematic Catalogue. Washington, D.C., 2000: 58-63, color repro.